PRODUCT DESCRIPTION: Electric fogging machine which takes liquid material and converts it to a mist. This mist is then directed over an air space where mosquitoes are active. 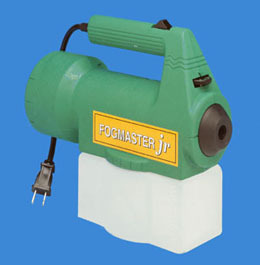 The mist or fog will quickly kill flying mosquitoes, gnats and other flying pests. It has a dial which enables you to keep it low, medium or high. There is also an on/off switch and a quart holding tank for chemical. TARGET PESTS: Mosquitoes, gnats, noseeums and other biting insects which are drawn to people. WHERE TO USE IT: Around the home and patio or deck areas. This is perfect for the condo or townhouse owner who doesn’t want to invest a lot in such a machine but still has a need for fogging. Remember, this is for small jobs only. RATE OF APPLICATION: This machine is the smallest you can get which works well. It is designed for small jobs. It will treat 2500 sq/ft quite well but will begin to take too much time and work too hard if you have to cover areas up to 5000 sq/ft. 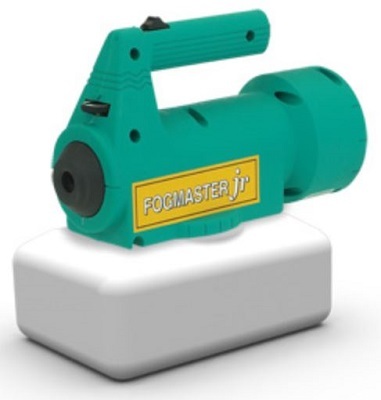 If you have that much area to fog, get one of our other models available as you will need it. It can handle both water and oil based chemicals.